This dressing gown was made because I found a good fabric match - a blue (with a touch of purple) poodle sweater knit from fabric.com. The trim was custom made by Suomynona Couture, and is still available if anyone is interested. It is nearly an exact match to the real trim. I hand-beaded the tassels for the front, and the smaller tassels for the wrists and shoulder. The robe also has beaded/sequined accents at wrist and shoulder. I made the lace underdress from poly lace found on ebay - it is lined with white silk satin. I made this in 2005, but never really wore it. It's kind of warm. 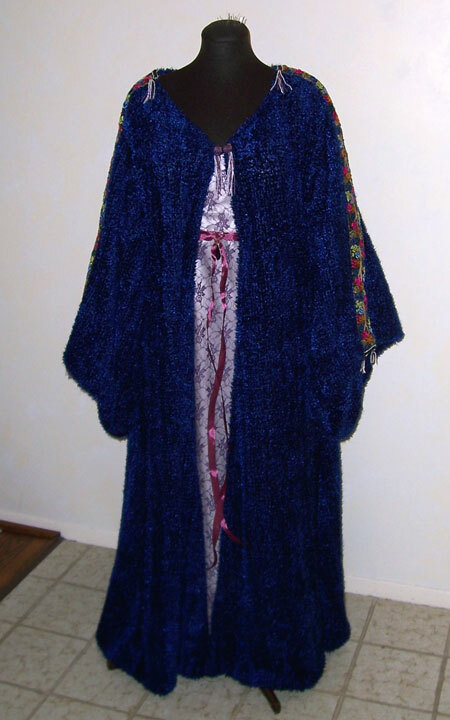 I don't love the underdress, but I actually do love the robe.